Are you in France? Share your images with CNN. 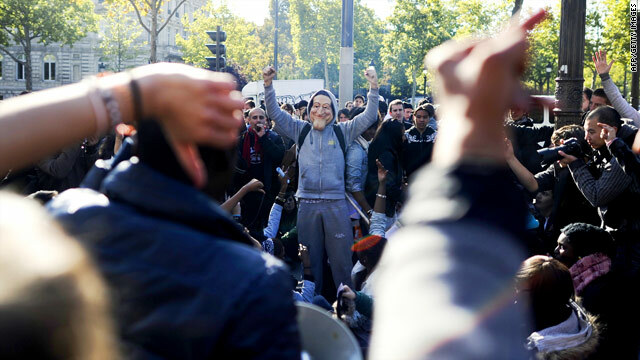 Paris, France (CNN) -- The French Senate Friday defied tens of thousands of protesters and approved its version of a controversial pension reform measure with a vote of 177-153, bringing the package one step closer to implementation. A conference committee of seven senators and seven members of parliament will meet early next week to reconcile the differences between the Senate and National Assembly bills. Each house will then vote for or against the bill proposed by the conference committee. A final vote on the reform is expected early Tuesday or Wednesday in both the Senate and National Assembly, according to a spokesman in the Senate. As is the custom in the Senate, senators voted Friday by placing plastic credit-card sized tokens into one of three different urns indicating a vote for, against or in abstention. The cards were then poured out into a scale and the vote was calculated by the total weight of tokens in each urn. Labor Minister Eric Woerth said Thursday that the retirement reform has been the single most debated bill in terms of the number of hours the Senate has spent examining it since the creation of the fifth republic in 1958. Protesters have scuffled with police and blockaded oil refineries and terminals for days as tensions flared over the proposal to raise the retirement age from 60 to 62 -- a measure that the government says is necessary to save money. "It was our job to do this reform," Woerth said after the Senate vote. "It's to assure that our children can have the same pension benefits that we do." French Finance Minister Christine Lagarde has said the country cannot continue to pay its debts -- to retirees and others -- by borrowing at current levels. The government's announced goal is to cut the deficit from 8 percent to 6 percent of gross domestic product by next year, an ambitious goal. The lower house of parliament passed the pension reform bill in September, by a vote of 329 to 233. More than a million people have turned out nationwide to protest the proposal. Six major French unions have called for further nationwide demonstrations on October 28 and November 6, saying that protests so far show the people are ready to dig in for the long haul. The country has faced fuel shortages because workers are on strike at all 12 of the nation's refineries, and protesters are blocking 14 of the country's 219 oil terminals. French riot police ended the blockade of an oil refinery near Paris early Friday morning as members of the Gendarmerie Nationale instructed strikers to free the facility, a police spokesman said. The spokesman said they encountered no resistance, and strikers continue to protest in front of the refinery. Energy Minister Jean-Louis Borloo said Friday that the situation was slowly getting better. "We're headed for improvement," he said, noting that about 80 percent of the country's service stations were functioning normally. A union leader told CNN affiliate BFM that the police action at the refinery Friday morning was a "disgrace." "Taking advantage to come in the middle of the night like that. What country are we in? What country are we? The country of human rights?" said Charles Foulard, a local union official for the General Confederation of Labor. Officials countered that they were doing their jobs. "When we intervene, we try to do it in the hours when it is the calmest, because our wish is that things go well. We are not here to provoke trouble ... we are here to execute a government decision through a legal process which is requisitioned," said Seine-et-Marne Prefect Jean-Michel Drevet. One of the problems for strikers who are blocking fuel shipments is that France is entering a two week school holiday period and thousands of French families will want to fill their tanks for vacation trips. While polls have shown a majority of the French people back the strike, political observers have said that could shift quickly if the strikers are seen as blocking French families from taking their vacations. CNN's Jim Bittermann and Bobby Afshar contributed to this report.